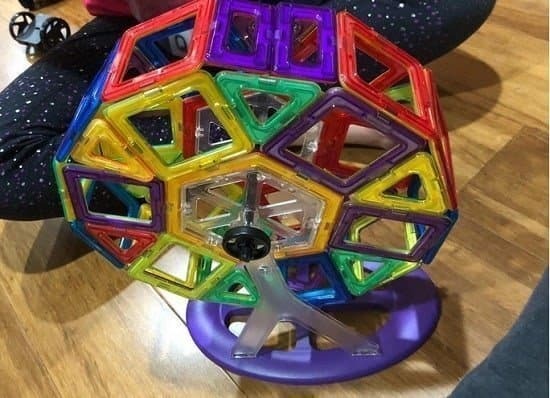 Why are parents and kids so “attracted” to magnetic toys this year? There are many reasons! Magnets in and of themselves are fascinating. Kids love playing with magnets, learning about their poles, and playing with different strengths and sizes. Additionally, magnetic toys are almost always educational and great for STEM development. 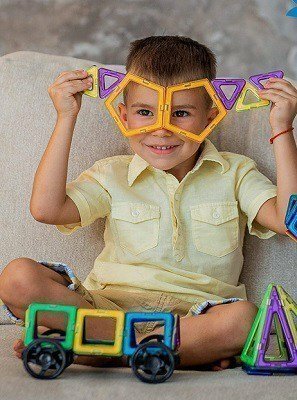 Many of the magnetic toys on this list envelop mathematical concepts like structure, design, and geometry and encourage kids to be creative and experiment. Others focus on the alphabet and spelling. One of the toys can even teach anatomy! Whatever your child is interested in, chances are magnets can make it more fun. Make sure magnets are large enough they can’t be swallowed. Eating magnets is very dangerous, so be sure the toy you choose does not pose a choking or swallowing risk. Choose a toy with magnets strong enough to do their job. Magnet toys are no fun if the magnets don’t hold together. Buy something that is age-appropriate. Of course, a toddler will not enjoy a magnetic toy for 8-year-olds and vice versa. Be sure to look for a toy that will fit your child’s interest now and into the near future. Get a toy you will want to play with your child. Magnetic toys are fun to play together, so choose a toy you can enjoy with your child. You might be surprised at how exciting magnetic toys can be even for adults! A magnetic toy is sure to become your child’s favorite! 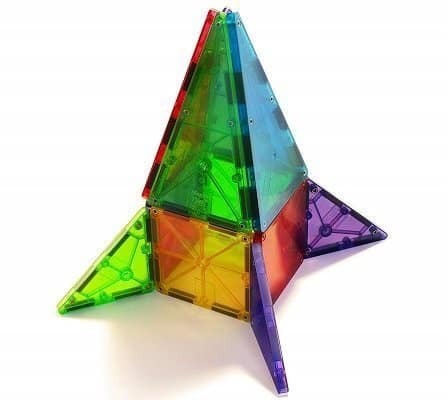 Magna-Tiles are magnetic building toys appropriate for all kids older than about age two. 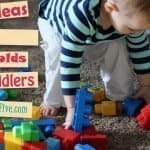 They’re a great magnetic toy for toddlers because they’re less frustrating to build with than traditional blocks. They continue to be exciting for older children who can build more advanced structures. This set of 100 tiles includes three types of triangles (equilateral, right, and isosceles) and two sizes of squares in five colors. Not only do they grab a child’s attention, but they are also a great first introduction to geometry and engineering. Magna-Tiles are durable. They’re not indestructible — the magnets can fall out if the pieces are thrown too hard — but they are built to last. They’re used in preschools and day cares all over the country and can stand up to years of being played with. Many parents agree they are worth the splurge. 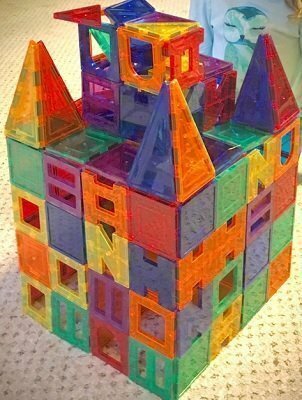 Although Magnatiles is the leading brand, surprisingly it’s not the best-selling magnetic building set on Amazon. The best-selling set on Amazon is the 100-piece set of PicassoTiles, which are nearly equivalent to Magnatiles. PicassoTiles are slightly heavier and have slightly weaker rivets, but they have equally strong magnets. The real selling point, though, is that they’re nearly half as expensive as Magnatiles. 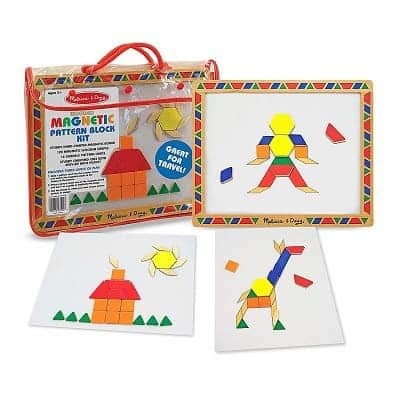 If you are looking to grow your magnetic toy collection and you don’t want to spend a fortune, consider Picasso Tiles. If you already own Magnatiles, no worries: PicassoTiles will work with them. If you’re just starting out, consider starting with this 100-piece set. This set contains five piece shapes and four colors that will make it easy for your child to create any structure they can dream up. PicassoTiles are a good alternative to LEGOs. 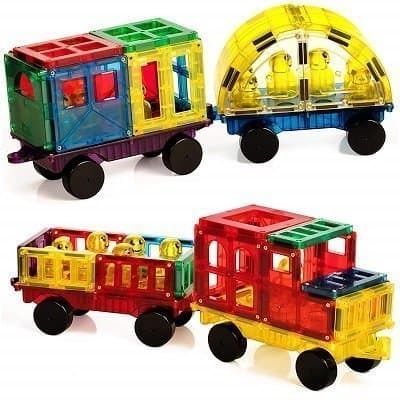 Like other magnetic building sets, this Magnetic Stick N Stack set comes with lots of different colored tiles, but what’s fun about this set is it comes with locomotive and car-specific building pieces. 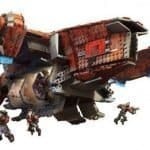 That means there are car bases, arches, window frames, wheels, door pieces, magnetic people, and more. The magnets in this set are strong and compatible with other magnetic tile building sets. The one complaint about this set is it may leave you yearning to buy more tiles, since the locomotive pieces take up nearly a quarter of this 100-piece set and may leave you building shorter towers. Since the car pieces are not as open-ended as other building pieces, they may be more suited for older builders, though young kids can certainly play with them as well. If your child has taken an interest in magnets, this magnet lab kit is one way to fuel her curiosity. It comes with over 100 durable magnets of different sizes and strengths for your child to experiment with. The set also comes in a nifty storage bin and includes a book of guided activities. This kit is the perfect resource for elementary and home school learning, but you’ll have to make sure to keep it away from kids younger than five because the small pieces are a choking hazard. Unlike other magnetic toys, this one may require some adult supervision and guidance, but it’s the magnetic toy on our list with the best potential for learning. Fridge toys are a true favorite because they’re perfect for dinner prep. Your little tyke can be in the same room as you and chat with you, but still keep himself busy with his own toy. These colorful Melissa & Doug letter magnets are decorated with adorable Mickey Mouse patterns, and the set includes both uppercase and lowercase characters. If your child is learning to spell, you may want to get two sets, as one set alone doesn’t have enough characters for spelling many words. If he’s just learning the alphabet, one may do the job. These fridge magnets are highly rated, though some parents don’t love that the stickers peel off when small children put them in their mouths. Be wary of using them around young kids, but otherwise they make for a fun, educational toy for children over the age of three. 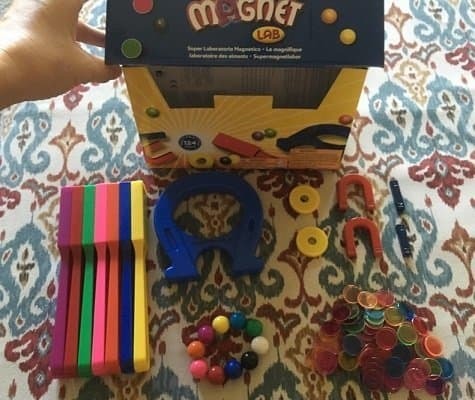 This magnetic kit can seriously teach kids the true power of magnets. 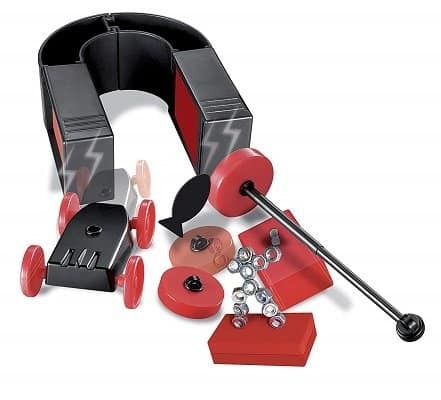 With instructions for making a “Super Power Horseshoe Magnet,” and details for constructing a “Super Magnet Racer” and a “Yacht Compass,” even adults can be entertained by and learn something from this toy. The science kit is recommended for children over age 8, but it is really geared mostly to younger children (we recommend it for ages 5-9). With adult supervision to keep children from ingesting small parts, it would make a great toy to add to your home school or special adult-supervised activities. One motor. Six gears. Hours of entertainment! Your children can place the gears in a variety of patterns to learn which way the gears turn when interlocked with each other and the motor. 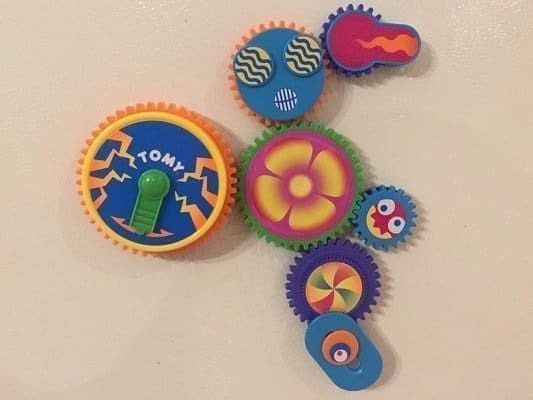 Each gear in this TOMY gear set has a strong magnet attached to the back so it can be stuck to the fridge. The magnets are strong enough that they won’t fall off when the fridge door is opened and closed, but not so strong that kids can’t move them around. It’s an ideal toy for the rambunctious three-year-old who wants to hang out in the kitchen with mom and dad during meal preparation. One drawback to this toy is that, unlike other magnetic toys, the motor requires batteries. Luckily, the motor has a long-lasting battery life. This is the traditional geometric pattern set that you may remember from grade school, but this one has magnets attached to each piece so they’re less likely to get lost and are perfect for traveling. It contains a whopping 120 magnetic shapes, six double-sided cards, a magnetic board, and a carrying case. Children of all ages can enjoy playing with this set. Younger children enjoy mimicking the patterns on the cards and older children enjoy creating their own designs. 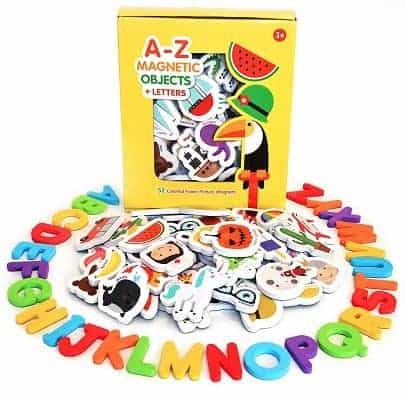 The set is made by Melissa & Doug and the magnets and wood are sturdy, but it’s best played with on a flat surface because the magnets aren’t extremely strong and may slide down the board if it’s tilted. 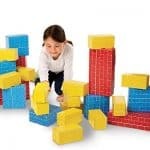 These magnetic building blocks come in at a budget-friendly price of less than $50 for 123 pieces. The set includes wheels, letters, numbers, 10 types of shapes for building, and four unique pieces that can be used to construct a ferris wheel. It all comes in a cute, sturdy plastic container that’s ideal for storage or taking the toys from place to place. 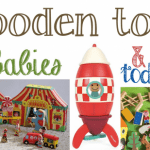 This set is includes an idea book filled with projects that are both easy and challenging, but the pieces can still be put together in any way you can imagine and makes for an exciting, open-ended toy. The pieces are durable and the magnets are built into the block, so there’s no risk of them coming off. These magnetic objects and letters are made of sturdy, thick foam and are the perfect size (2-2.5 inches) for little hands. There are 52 letters and 26 objects, and the objects are beautifully illustrated with descriptions. Having both letters and objects is fun because your child can learn to associate letters with what they stand for, like “A” for “airplane”. There are two objects that start with each letter, so it’s a perfect matching opportunity for older children. The pieces feature full magnetic backs, which is important because it means the magnets are too large to be ingested by little ones. The magnets, however, can still be damaged if they’re chewed on, so keep them away from tiny teethers. This set is a great value for its price and is the perfect magnetic toy for preschoolers. Let your kids play with the magnets on your fridge or give them a cookie sheet to use the magnets on the go. 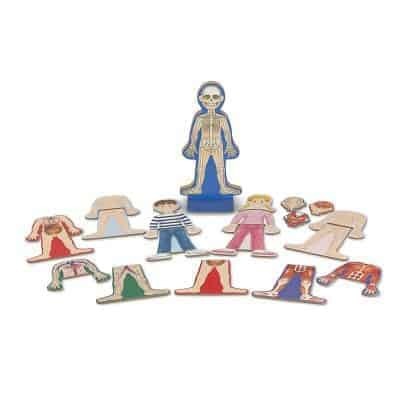 If your child is curious about the human body, this magnetic human anatomy play set is perfect. It shows the layers of the human body: bones, nerves, organs, muscles, and skin — so children can learn about them and their functions. The 24 magnets in this set are high-quality and stackable and will last through lots of playtime. This set is great for kids as young as three because they can begin to learn where blood comes from and what it means to break a bone. Warning: The magnets are anatomically correct, so they includes both female and male genitalia. It may spark your child’s curiosity in male and female differences, which may actually be good as you can begin to teach aspects of privacy and inappropriate touch. If you’re not ready for your child to learn about these things, it may be best to avoid this one. Who could have guessed there are so many fun toys that use magnets? It’s easier than ever to turn your refrigerator into a place that not only feeds your kids bodies, but feeds their minds. You can bet I’m putting those gears into my child’s stocking this year!